When I was searching to find some books on forex technical analysis, I got a guide of only five pages, which opened a new window in front of my eyes. I came to know that the candle stick patterns can give me some interesting signals to place successful orders on forex market. I searched different sources to find more details about candlestick formation. I was surprised to know that historically Japanese first started using candlestick to trade rice in 17th century. Candlestick charting now widely used in financial markets to illustrate the changes in level of price over time. 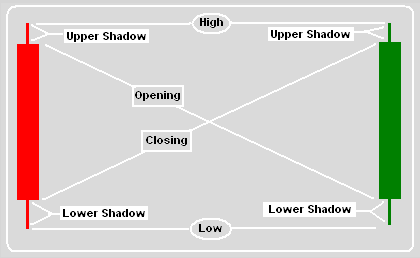 A Candlestick has generally 6 parts high, low, opening, closing, upper shadow and lower shadow etc. 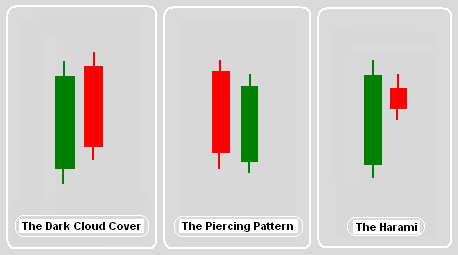 Candlesticks are classified into two types bull candle and bear candle. A bull candle represents increase in price level, and a bear candle represents decrease in price level. The green candle is a bull candle, and the red candle is a bear candle. I have found some of the interesting candlestick patterns that can be helpful to trade forex. The Hammer: A candlestick is called hammer when it has a lower shadow twice the length of the main body and no upper shadow or a small upper shadow. It appears at the end of the downtrend, and indicates a reversal. If it appears at the top of a uptrend, it is called hanging man,and indicates a reversal. The color does not matter. The Star: The stars have long upper shadow. When they are at the top of a uptrend they are called stars and indicates a reversal. When their position is at the bottom of a downtrend they are called inverted hammer. As inverted hammers they also indicate reversal. The Doji: A candlestick become doji when it has almost similar opening and closing. A doji indicates reversal when it is at the top of a uptrend. It also indicates reversal when it is at the bottom of a downtrend but with some conditions. Doji are of three types the Gravestone, the Dragonfly, and the Rickshaw . 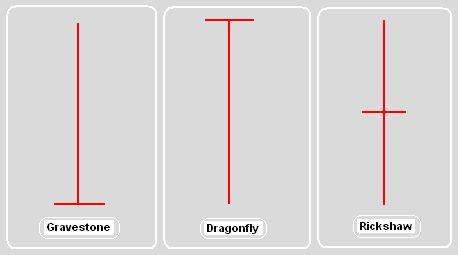 A Dragonfly doji has long lower shadow, and indicates the bottom of a downtrend. A Gravestone doji has a long upper shadow, and indicates the top of a uptrend. A Ricksha doji has almost equal upper and lower shadow, and indicates indecision in the market. It is not obligatory that a doji of any type must have same opening and closing price, rather some time they may have small body. Even some dragonfly and Gravestone doji may have small upper and lower shadow respectively. 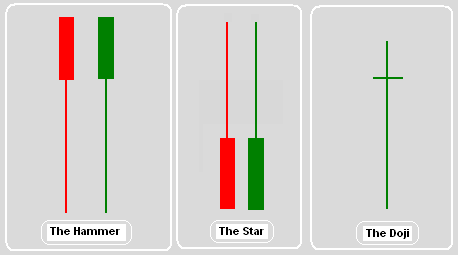 The Shooting Star: This candlestick has a long upper shadow and indicates that the market fails to maintain the momentum and indicates a reversal. The color of the candle stick does not matter. The position of a shooting star is on the top of a uptrend and signals a downtrend. 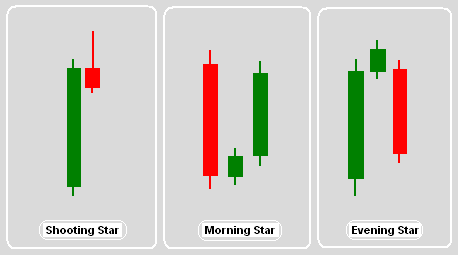 The Morning Star: It is a three candles formation where first candle is a bear candle, second candle is a small bear or bull candle, and the third candle must be a bull candle, which must cross at least half of the first candle. If the second candle is a doji, the morning star signals strong reversal (buy signal). A morning stars appears at the bottom of a downtrend and indicates that the market may go up. The Evening Star: It is also a three candles formation where first candle is a bull candle, second one is a small bull or bear candle, and third one must be a bear candle that crosses at least half of the first candle. If the second candle is a doji the evening star signal even stronger bearish trend. An evening star if positioned on the top of a uptrend it indicates that the market may go down. The Bearish Engulfing Pattern: It is a two candles formation, first one is bullish candle and second one is bearish. The second candle opens higher the closing price of first candle, go down and crosses at least half of the first candle. This formation indicates that the market may go down now. This formation are found at the top of a uptrend. 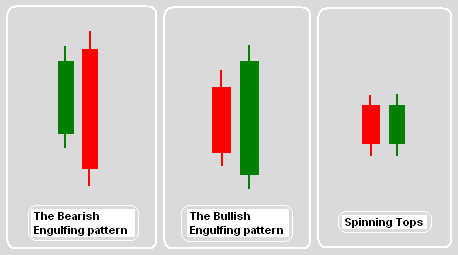 The Bullish Engulfing Pattern: It is also a two candlesticks formation, first one is bearish and second one is bullish. The bullish candle opens lower than the closing price of bearish candle, and covers at least half of the bearish candle. It indicates that the momentum is shifting from bearish to bullish. Spinning Tops: This formation includes two or three small body candles with small or now shadows. This formation indicates a “tug of war” between buyers and sellers. The Dark Cloud Cover: It is a two candle formation, where first one is bullish and second one is bearish. The second candle opens higher than the closing of first candle, and crosses at least half the main body of first candle. It indicates bearish reversal. The Piercing Pattern: It is also a two candle formation, where first candle is bearish and second candle is bullish. Second candle opens below the closing price of first candle and crosses at least half of the main body of the first candle. It indicates a bullish reversal. The Harami: It is a two candle formation where first candle is a big candle and second candle is a small candle. The second candle is created completely within the main body of the first candle. The color of the candles does not matter. But if the colors are opposite the reversal signal is considered stronger. If the second candle is a doji, the harami cross indicates very strong reversal. The harami can be found any where top or bottom of the trend. If the harami cross found in any important location like pivot point, support, or resistance, then the reversal is warranted. Dear Friends, these are some of the most important candlesticks formation patterns that can be very helpful to understand the market's movements. If you have any other candlesticks patterns, you can share with us.